We have arrived at the one and only direct Sanjô offshoot, the Gojô School. According to tradition and as seen in the Sanjô Genealogy presented here, the offshoot was founded by Sanjô Arikuni’s (有国) son Kanenaga (兼永) who lived and worked in the vicinity of Kyôto’s Gojô axis, what earned the school its name. Traditionally Kanenaga is dated around Chôgen (長元, 1028-1037) but what has to be seen in the context of bringing him in about “grandson-distance” to Munechika who, as we know, is traditionally dated around Ei’en (永延, 987-989). Before we continue I have to address an obvious thing, and that is the course of this series. As you can easily see, talking about the early schools – i.e. everything that comes with a “Ko-” prefix (like here Ko-Kyô-mono) – means dealing with a big lack of extant references. So no one can avoid making his or her way, hand over hand, along the very same few blades and matching them as good as possible with the written references (which on top of that differ from each other). Apart from that, the historic references were often written in a rather flowery style and early oshigata were highly subjective copies of a blade’s characteristics. In addition, there had been this “need” among upper (warrior or aristocratic) classes from the earliest times on for having swords by certain famous master in their collection. This lead to many counterfeit signatures and attributions of unsigned blades to famous names which in turn later entered the annals as alleged original references themselves. And when we combine all this, it should be easy to imagine that we are facing a huge hodgepodge of data and it is not surprising that many unsigned blades that are attributed to a certain smith or school do not really match the interpretations of the very few extant signed specimen. As for Kanenaga, there are only five signed blades extant, or just two if you rule out the three where only the character for “Kane” is left (at two of them the blade is shortened up to the character of “Kane,” both are jûyô, and at the other one, which is tokubetsu-jûyô, only the “Kane” character is illegible of the niji-mei). The two “unshakeable” ones are designated as jûyô-bunkazai and as jûyô-bijutsuhin respectively whereas they signature differs (see picture 1). The former is signed in an overall somewhat larger manner than the latter and also the lower part part of the character “Kane” (兼) is chiselled in a different manner. The jûyô-bunkazai tachi (picture 2) is slender and has a deep koshizori with funbari and a ko-kissaki. The kitae is a dense ko-itame with plenty of ji-nie, fine chikei, and faint nie-utsuri. The hamon is a ko-chôji in ko-nie-deki with a rather wide nioiguchi that is mixed with ko-midare, ko-gunome, ko-ashi, and kinsuji. The bôshi is sugu with a ko-maru-kaeri, nijûba, and hakikake. The tang is entirely ubu and has a kurijiri and one mekugi-ana. 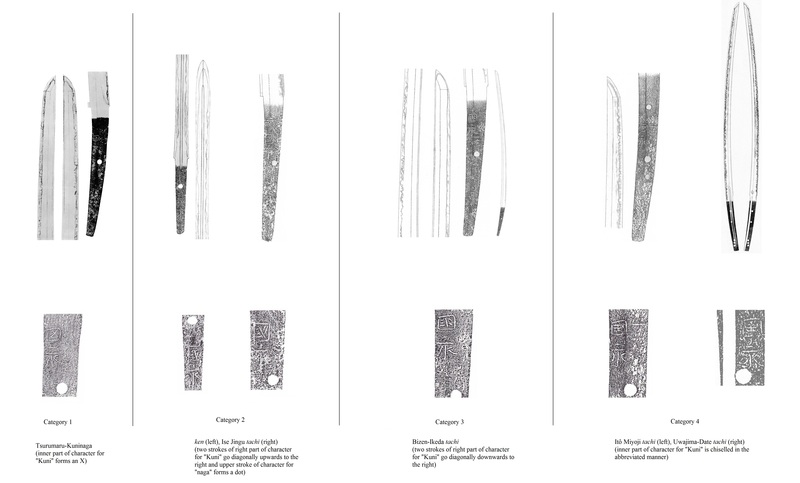 The blade has an elegant and very classical shape but again we have here (see chapter on Sanjô Yoshiie) some characteristics that make one think of Bizen, for example the relative large amount of “real” chôji (i.e. not just chôji ashi along a suguha-chô but “actively” protruding chôji tassels), especially along the monouchi where the hamon shows conspicuous ups and downs. So the overall quite sophisticated interpretation of the jiba speaks on the one hand for a later production time, i.e. rather early Kamakura than mid-Heian, but the classical shape and the nijûba along the bôshi which tie the blade to the Sanjô school on the other hand speak for Heian. Thus we maybe meet in the middle, which would be late to very end of Heian. I don’t have any information on the jûyô-bijutsuhin so I want to focus on the tokubetsu-jûyô of which the second character is illegible but which is otherwise ubu. Please note that the NBTHK is, as often in such high spheres, careful and gives an attribution to Gojô as there also other Gojô artists active whose names start with “Kane,” e.g. Kanetsugu (兼次) and Kaneyasu (兼安). Well, these smiths quasi only exist on paper as no signed blades are extant by them, but it is true, you just can’t make a straightforward Kanenaga attribution if you are not entirely sure. So the tokubetsu-jûyô (picture 3) also has an elegant sugata with a strong koshizori, funbari, and a ko-kissaki. The jigane is an itame with ji-nie and a faint nie-utsuri. The hamon shows this time not so many chôji. It is a suguha-chô in ko-nie-deki that is mixed with ko-chôji, ko-midare, and plenty of ashi and yô. The nioiguchi is rather tight but tends to be dull along the monouchi. The bôshi is sugu with a short ko-maru-kaeri. Now to Kanenaga’s alleged son Kuninaga (国永) with whom we are facing the very same difficulties. He is listed, as mentioned, as son of Kanenaga but some see him as his younger brother. Traditionally he is dated around Tengi (天喜, 1053-1058) but problem here is that several of Kuninaga’s works even look a hint more classical (i.e. old) than works of Kuninaga. But again, evidence base is very limited. As for “unshakeable” signed Kuninaga works, there are only six known, and within these six, we can make out four different signature variants with experts being in disagreement on the dating or attribution to different craftsmen and/or generations. Let’s start with Kuninaga’s famous work, the imperial treasure (gyobutsu) Tsurumaru-Kuninaga (鶴丸国永) (see picture 4), whose mei makes up one of the four categories by itself. Well, at least most experts agree that the Tsurumaru is not only the best work of Kuninaga but the best of all Ko-Kyô-mono in existence (and some even say that it is the best Yamashiro work of all). The blade is ubu and kenzen, i.e. in perfect condition, what adds to the value of the piece, and shows an elegant sugata with funbari and a deep koshizori that bends down towards the tip. The kitae is a very densely forged ko-itame with fine and beautiful ji-nie and the hamon is a suguha-chô with ko-midare and ko-chôji in thick nioi, plenty of ko-nie, and kinsuji. The bôshi tends to sugu and has a ko-maru-kaeri. So the Tsurumaru shows overall a more sophisticated workmanship than the Mikazuki-Munechika and dates therefore somewhat later. 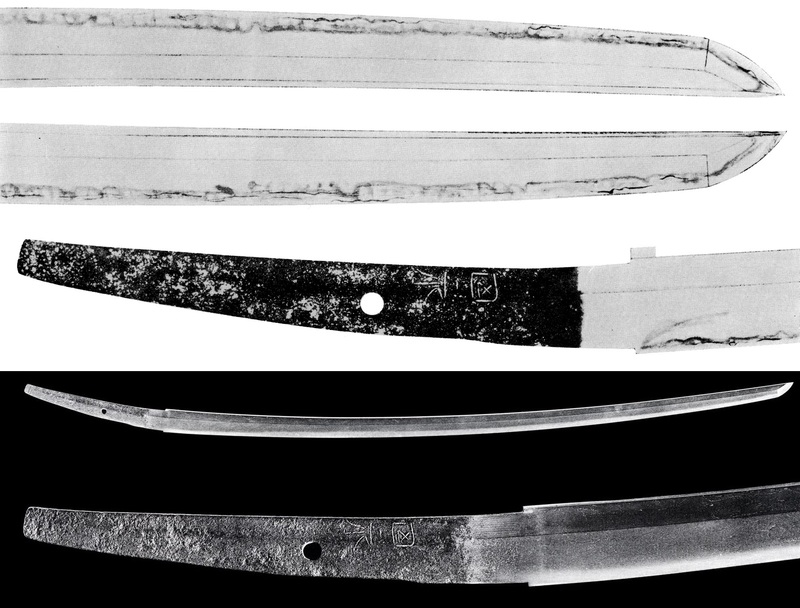 Category two of the known Kuninaga-mei contains two blades, a tachi that is preserved in the Ise Shrine and a jûyô-bunkazai ken (see picture 5) that was once owned by the tôsôgu expert Kokubo Ken’ichi. Unfortunately, I have no picture of the Ise Shrine blade but want to assume for the time being that the workmanship is similar to that of the ken as also the mei is very similar. My assumption bases on the following two factors: One is the statement of Honma sensei who was of the opinion that the Ise Shrine tachi is the oldest extant signed work of Kuninaga. And the other factor is that we can see a lot of the very classical, “naturally layered” approach of the ha at the ken. This feature can also be seen on the works of Sanjô Munechika what supports an earlier production time. The Ise Shrine tachi is slender and shows a koshizori and a ko-kissaki The kitae is itame that is mixed with ô-hada in places and the hamon is a nie-laden hiro-suguha-chô that is mixed with ko-midare and ko-chôji that comes with a more subdued nioiguchi. The ken shows a noticeable amount of masame along the kitae what makes it kind of yamatoesque. This and the fact that it is, well, an old ken, might add to the subjective “old feel” of the blade and Tanobe sensei assumes that ken had always been forged in a more classical way because making them had a strong religious and ceremonial character and did not leave much artistic freedom or room for trying something new. Apart from that, Tanobe also assumes that the subdued nioiguchi and thus more ancient feeling hamon of the Ise Shrine tachi goes back to a loss of hira-niku and that the hamon might once had been similar to that of the Tsurumaru. And Tsuneishi Hideaki (常石英明), the author of the Nihontô no Kenkyû to Kantei and Nihontô no Kantei to Kansho, even assumes that mei of category two go back to a third generation Kuninaga. Tsuneishi also says that the Tsurumaru-mei dates to the later years of a the first generation Kuninaga. Also rather classical is the tachi whose mei forms category three. 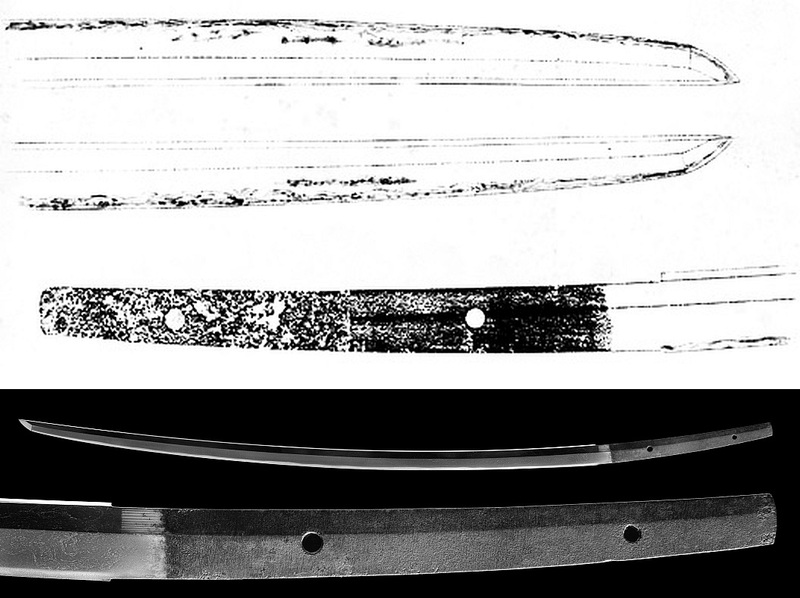 The blade was once a heirloom of the Bizen-Ikeda (備前池田) family and is completely ubu (see picture 6). It is slender, has a deep koshizori that bends down towards the tip, funbari, and a ko-kissaki. The kitae is itame and the hamon is a suguha-chô that is mixed with ko-midare and plenty of ha-nie, ashi and yô and that turns into a nidan-ba in places, i.e. a two-layered ha that consists (in this case) of a ko-midare-chô with much nijûba that makes it look like as if a “second” ha, a suguha, runs atop of it. 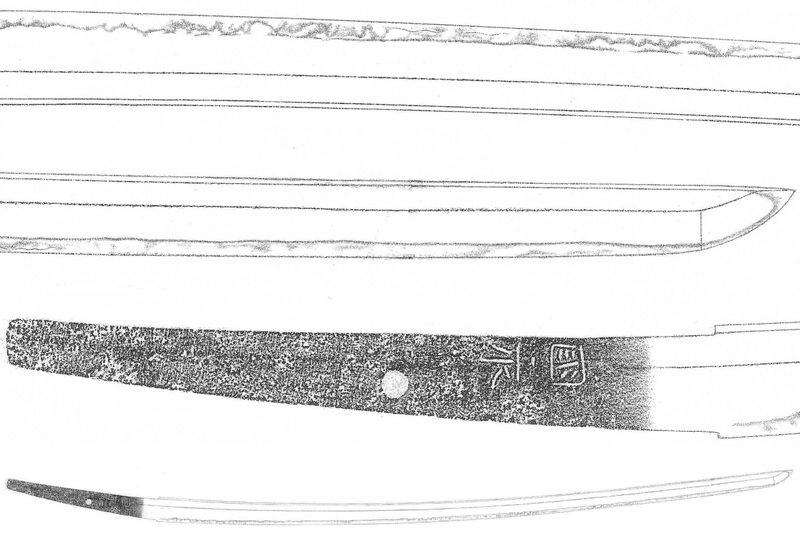 Tsuneishi attributes this blade to the early period of Kuninaga. And category four is formed by two blades, a jûyô-bijutsuhin tachi that was once owned by Itô Miyoji (伊東巳代治, 1857-1934) and a jûyô-bijutsuhin tachi that was once a heirloom of the Uwajima-Date (宇和島伊達) family. Tsuneishi says that the mei of this category go back to the second generation Kuninaga and Tanobe suggests that their workmanship can be considered as a kind of precursor of the later Yamashiro smiths, e.g. Ayanokôji Sadatoshi (綾小路定利) and Awataguchi Kuniyasu (粟田口国安). The tachi of Itô Miyoji (see picture 7) has an elegant sugata with some traces of funbari and shows a very densely forged ko-itame with penty of ji-nie and fine chikei. The hamon is a suguha-chô with ko-midare, plentiful of ko-nie, mixed with ko-chôji, and shows many hataraki in the form of yubashiri and repeated ashi especially in the area of the monouchi at the haki-omote side. In addition there are small and faint yubashiri and tobiyaki which run parallel to the ha but not in a continuous manner. The nioiguchi tends to be subdued. The other jûyô-bijutsuhin, i.e. the one from the possessions of the Uwajima-Date family, is suriage and shows the remnants of a relative wide and deeply cut suken on the one, and a koshibi with atop a bonji on the other side. It has a fine ko-itame with some nagare and plenty of ji-nie and yubashiri which tend to form an utsuri over almost the entire blade. 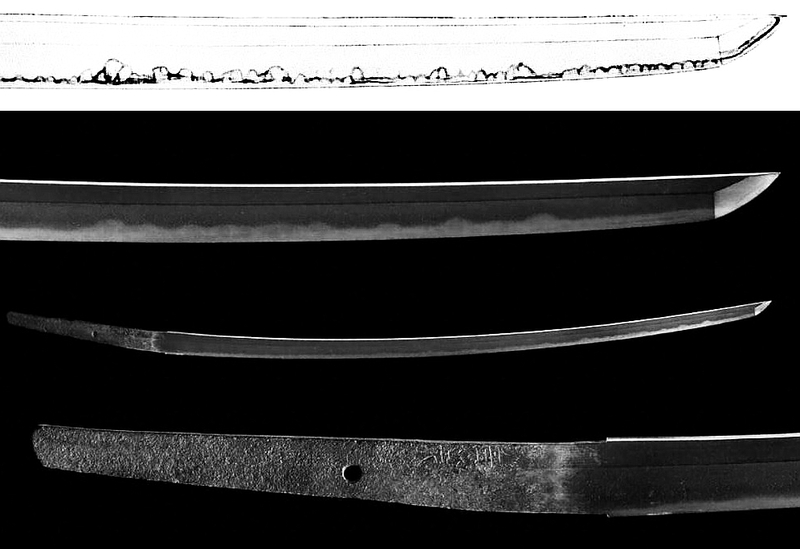 The hamon is a nie-laden ko-chôji with many fine kinsuji and the bôshi is like at the Itô Miyoji blade more calm than the rest of the hamon and appears with as midare-komi with a short ko-maru-kaeri. So all in all, these two blades make with their rather flamboyant hamon a more sophisticated impression than the Bizen-Ikeda blade whereupon I don’t follow the approach of Tsuneishi of the latter being a work of a third, and the former two a work of a second generation, although I tend to think (for the time bing) that there was probably more than one generation Kuninaga as the mei and the workmanship show significant differences. For a better overview of all this “confusing” information, I have arranged above a large pic with the four mei categories in its center with all the so-far introduced blades connected to them so that you see it for yourself. So click on it, zoom in, and enjoy J. Last but not least I want to introduce a blade that is attributed to the Gojô school, i.e. not differentiating between Kanenaga and Kuninaga, but which is in my opinion insofar important as it forms kind of a link to the Sanjô school. 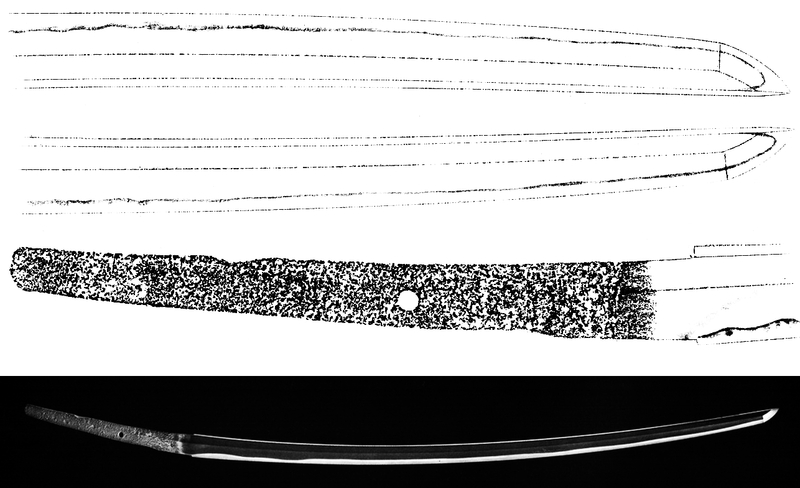 It shows a nie-laden ko-midare that is mixed with ko-chôji, ko-ashi, fine kinsuji and sunagashi, and prominent yubashiri, nijûba and sanjûba (especially along the upper half of the blade) that create this “layered” appearance, although here no longer as ancient looking as at Munechika (but still pretty much classical). For a more detailed write-up and excellent pictures of the blade and its hataraki (highly recommended), please go to Darcy’s page here. That should do it for today and with the next part we are slowly entering Kamakura times when I will talk about the Ayanokôji school.